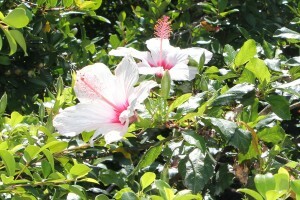 I have two hibiscus shrubs (but they are more like trees). Both have obviously been here for many years as they are huge. I love these two shrubs because they are lovely to look at, always healthy and grow so rapidly that we have to keep cutting them back or they would take over completely. I’m a complete rookie at identifying plants and have made a few mistakes so far, but I think I have identified this Hibiscus in my garden correctly. 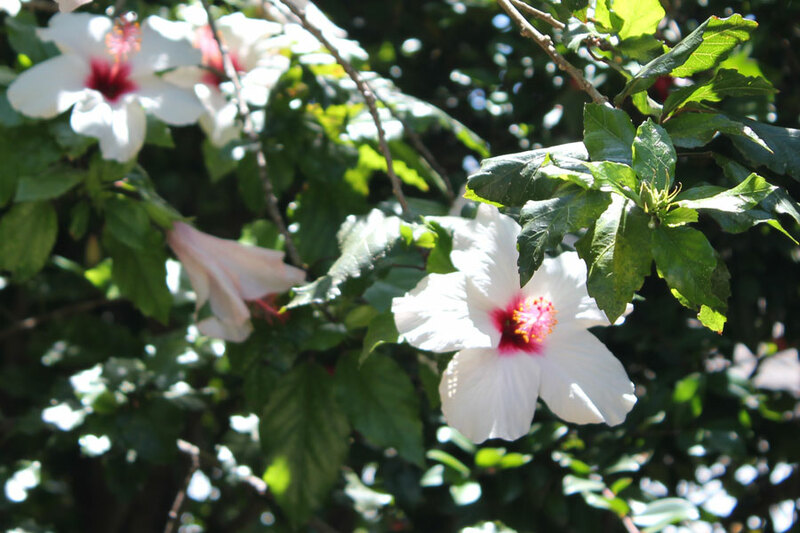 I believe it is a Hibiscus rosa-sinensis, also known as Chinese Hibiscus which I read actually originates from South-East Asia. The one in these photographs lives in my back garden, right in the far corner inbetween two trees (which I have yet to identify). It requires little attention besides hard pruning once or twice a year, has lovely foliage and produces masses of flowers seemingly all year round. The second one lives in the “back yard”, in a cemented area where it grows out of a hole in the cement between our and our neighbours’ properties. I like it there – it is where our rubbish bins and pool pump live and it transforms this area from being unattractive to a shady, flower filled area. 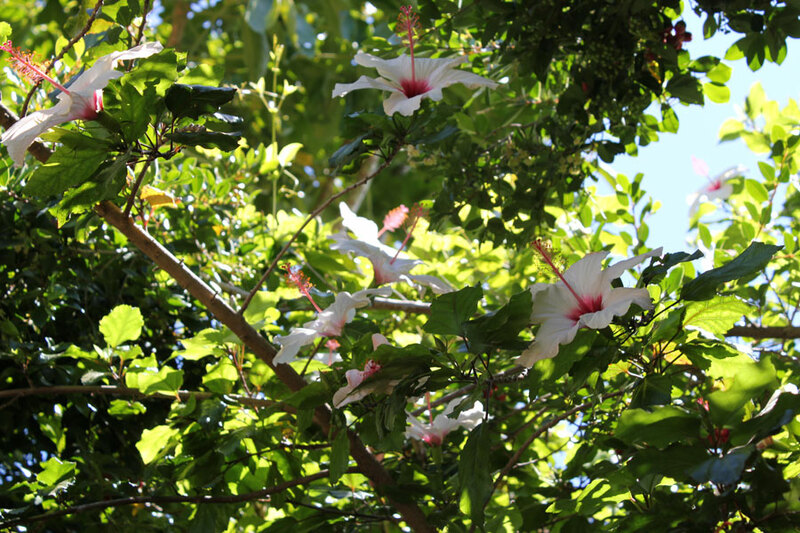 This Hibiscus is also huge and requires hard cutting back at least twice a year or it would grow into the windows of the house. Birds and bees seem to love these two shrubs / trees. I see birds here every day which always makes me happy. I read up today on how to propogate Hibiscus. I can’t promising anything … I’m so brown-thumbed it might not work, but if I do get it right, would you plant it in your garden? It is such a friendly plant! Unfortunately, I don’t have on e in my garden, but if I did I would immediately want to know its health-giving properties. I have found and also tried Hibiscus Tea – very refreshing and healthy! It is said to Reduce Cholesterol Levels and Reduce Heart Disease Risk. Hi Liz, I don’t think they would do very well in Northern Alabama – I looked around on the Internet and apparantly you won’t get the same lush growth and bloom there as you would in Florida and it might need to be brought inside or be protected in winter. What grows well in your area? Such a beatiful blossom. I have two of them in my back yard garden. Those hibiscus are gorgeous! I miss mine. I had several when we lived in Florida. I wonder how well they would do in Northern Alabama? The Gardening Blog is a blog by Barbie and Christine … life-long friends with two very different gardens. We are novice gardeners and through this blog we will be sharing our gardening experiences (all the highs and lows) with each other and anyone who cares to join us in “watching our gardens grow”. Based in The Cape, South Africa, our gardening philosophy is "Natural and organic is best". Join us as we learn to garden.